The technological advancements we’ve seen in the past couple of years have made it easier for many to work from home. In fact, a report from Forbes revealed that by the year 2027, 50% of the US workforce will be working remotely. Although the advantages of remote access are quite clear for employees, some businesses still don’t see its benefits in the same way. Today, we’ll show you different reasons why investing in an effective employee remote access could enhance your business. Employee remote access is a tool that allows workers to work remotely. With this program, they can work from home, coffee shops, libraries, or anywhere outside of a corporate space. Typically, employee remote access enables workers to access their office files and desktops on the go. This means that they don’t need to be at their office desks in order to access an important work file or data. Employee remote access can also help them stay productive 24/7 since they have access to their company’s network from anywhere at any time. Increased Employee Satisfaction - Employees love working from home. This allows them to achieve a better work-life balance. With employee remote access, they can work in a more peaceful environment away from the busy nature of a typical office space. Remote working culture truly provides your employees with the level of freedom they won’t get inside of an office space. This, in return, translates into a more content and satisfied workforce. Enhanced Employee Productivity - If your employees are satisfied with what they’re doing, they are also likely to improve their work productivity. Expect them to produce work outputs that are of quality and value. This can better their overall performance which, in return, increases the effectivity of your business. They can also stay productive 24/7 using employee remote access. With this, they can address business demands and emergencies even outside of working hours. Reduced Overhead Costs - Your business can save an awful lot of money by investing in an employee remote access software. This means that you no longer need to spend money on additional office infrastructures and equipment. You don’t also need to spend regularly on some office essentials such as toilet tissue, coffee, and the like. Your business can also reduce costs on electricity and water expenses. With employee remote access, you’re not only cutting costs for your business, but you’re also reducing your company’s carbon footprint. One of the most effective employee remote access software in the market is ITarian Remote Access. This free remote access control tool allows employees to access their files, data, and even apps stored on their office desktops. With ITarian Remote Access, they can stay productive at work even if an unprecedented circumstance impedes them from being at their office. ITarian Remote Access encrypts every session made between the local and remote computers. This ensures that no confidential interaction is leaked and exposed. Session ConfirmationThis free employee remote access tool requires any remote user to provide the right login credentials first before he can connect to your network. 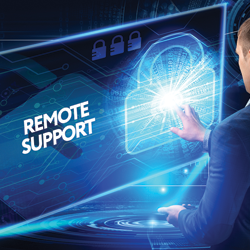 ITarian Remote Access allows you to access devices that have a multi-monitor setup. ITarian Remote Access enables you to connect to remote devices even without needing to configure your firewall settings first. Click Get Now For Free. Run the setup file on your default download location. Investing in an effective employee remote access can prepare you for the future of remote work. It can be one of the simplest ways for you to boost your business and enhance your employee's productivity rate. If you embrace remote work, you’ll be able to reap its rewards, too. Interested in getting ITarian Remote Access? Then gets yours here for free! Does Employee Remote Access information is useful?